Annual bluegrass (Poa annua L.) is a cool-season, annual grassy weed common throughout Louisiana. It spreads primarily though seed and favors compacted soils, but it can tolerate most soil types. It forms slightly open to dense clumps and can tolerate very low mowing, making it a difficult weed to control in turfgrass. Annual bluegrass has smooth boat-shaped leaves with leaf edges curving upward at the tip. Leaves are yellow-green in color and are typically folded. Leaves extend from the base of the plant, forming sparse to dense bunches. Inflorescences have clusters of small white to light green spikelets (grass flowers) on branched stems that extend from the base of the plant. Inflorescences can be open or tightly branched. Annual bluegrass has an upright, clumped growth habit. For more information on annual bluegrass identification and characterization, visit the USDA Plants Database at https://plants.usda.gov. The best way to prevent or reduce weed encroachment is to maintain a healthy lawn through proper fertilization and soil pH and regular mowing. Properly maintaining a lawn through these cultural practices promotes dense and vigorous turfgrass, allowing it to better compete with weeds. Below are the recommended mowing heights and nitrogen fertility rates recommended per turfgrass species. In addition to these lawn care practices, manual removal of weeds may also be necessary. Annual bluegrass is most prominent in bermudagrass turfgrass; therefore, turfgrass species selection can be an important factor in weed control. In addition to cultural practices, herbicide applications may be required to achieve effective weed control. Preemergence herbicides are an important component in managing annual bluegrass in warm-season turfgrass. For preemergence herbicides to be effective, the herbicides must be applied prior to weed emergence. Annual bluegrass seed germinates when soil temperatures fall below 70 degrees Fahrenheit. Preemergence herbicides are most effective on annual bluegrass when applied in mid- to late September in Louisiana. Annual bluegrass seedlings mature quickly in the fall and produce seed in late winter and early spring. 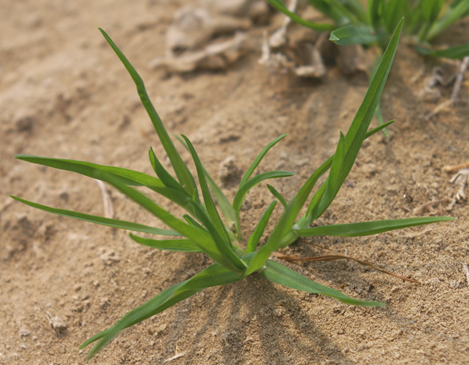 Post-emergence herbicides are more effective when applied to annual bluegrass seedlings before the seed heads are formed. Resistance to several preemergence and post-emergence herbicides is an increasing problem with this weed. It is highly important to alternate herbicides with different modes of action to reduce the potential for resistant annual bluegrass populations to proliferate.